So a month ago we were in a sobering warm spell that had me restless. 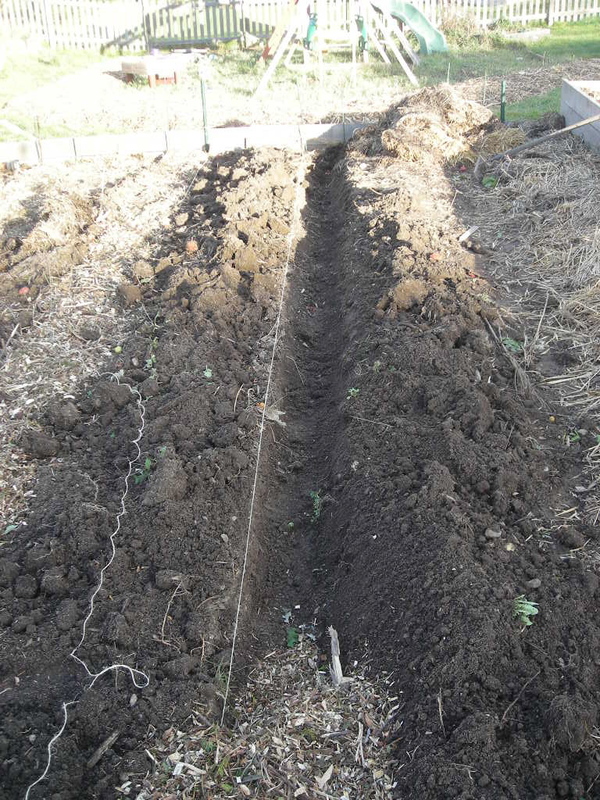 The incredibly warm temperatures were adding alot of energy to my need to get our gardens more self sufficient. I know (hope?) that Global Warming will have a lesser effect here (though we are already warming in a Big Way-the Arbor Day Foundation just moved Zone 5 100 miles north in WI from just 15 years ago) than in coastal regions or the western Mid-West (which should become much drier), but I still felt the need to do something. With the weather warm, I chose to go out and take root cuttings from one of my 3 Comfrey plants. I took those cuttings and packed 2-3 into good seed starting mix and some nice decorative pots that we had left over from some indoor plants I had killed last year (my green thumb turns brown indoors). I kept them moist, but time marched on. And on. And then three weeks went by. I moved one to the front window hoping that perhaps the sun would help warm the soil over the 65 degrees we keep the house at during the day. Then a month had passed with no growth. I consoled myself that the roots were probably sinking feeder roots, or that perhaps taking cuttings on Dec 30th wasn’t exactly a recipe for success. Then about 4 days ago a miracle happened. 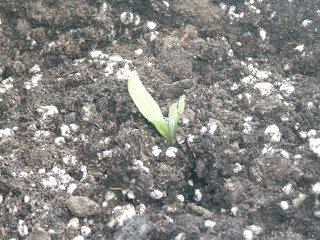 Comfrey leaves poked through the mix on the window pot, and yesterday the other 4 pots had shoots emerging as well. Success! I now have at least 6 new plants, and am expecting another 4 within the week. Enough to provide Grow Your Own Mulch for the 4 fruit tree guilds planned for this spring. If these work out I will provide them via my Someday Gardens site hopefully by June since not even Forest Farm and their 500 page catalogue offers them. Readers that are interested just shoot an email under Someday Gardens “contact us” link and I will hook you up cheap-barter or plant exchanges encouraged! So I have had cause lately to consider the merits of some of the different paths to Sustainability of late. On the one hand you have the Gee Whiz items like recycled paper towels that save 200,000 trees or CFL bulbs that save the equivalent of 1,000,000 cars worth of emissions. The “do a little, and do a lot” camp. Then there is the simplify movement and their imperatives. Eat Local! Grow your own food! Bike to work! Compost! Still another camp works to tweak the system itself thru Natural Capitalism, the Natural Step, or Green Development in an attempt to have our cake and eat it to. In the Mia/Beo household we are doing most of these in some form or another (less than some on the simplify, perhaps more than others in the system change) and the merits of them all come under fire at times. The Do a Little camp runs the risk of slacktivism attacks from those that have a more fatalistic, if perhaps truer, view of the future. Saving 1m cars worth of emissions just makes global warming only slightly less ominous if you believe that we already have 100 million too many cars to begin with. Of course these attacks rarely achieve the intended goal of inspiring the budding greenite to actually do more, and are much more likely to have them do nothing by scaring them off, leaving us all worse off. The Imperative Camp has the virtue of passion on their side and can get wonderfully clicky. Organic gardening really is fun, Farmers Markets are a great way to meet people in your community, and reducing your impact by cutting back pays big dividends in the pocketbook as well as garnering psychological benefits like the aesthetics of old. We really care… look what we’ve sacrificed for our cause! But we loose the mainstream real fast. Our society has force-fed us a steady Fast Food diet of Entitlement for two generations. Dammit I worked hard and I have earned my 70″ LCD TV! Good thing I have my Explorer to take it home in too! Look honey-we’re saving money on delivery fees! That change will take time and even the best homemade bread pales in the hypnotic light of the latest techno wonder. So which path do we pursue? Well, we are doing them all. Everyone starts somewhere, and we all bought our first CFL at one time. Think of it as a gateway drug to a greener future. But careful there. Just because we have taken the trip into the Imperative Camp doesn’t mean everyone is ready yet. One trap that I know we have fallen into is scaring the hell out of people with our passion-they aren’t there yet. If all they ever do is buy on CFL-or install the one we gave them -that is one step closer for us all. The Imperative Camp can be dangerous-you get so addicted to cutting back that you can have a break down. Look-we all need to shower and if people are noticing your cutbacks in a personal way you’ve gone to far ok? I am personally pushing the Tweaking Angle in a big way. I am now a trained study group facilitator in The Natural Step for Communities, and we are making real change in our village with the Green Committee. I believe that the darker future could be real and all the compost I make in my lifetime won’t save my children from the fate I foresee. I need to take (alot of) others with me. But that is the rub. Sustainability can take on a fervency akin to religion. And religion scares off a lot of people or leads to nasty Us v. Them thinking. We will win this fight by being the Good Samaritan quietly practising random acts of kindness, not thru mimicking the nutjob on the corner frothing over his Bible. Today at Church we had a guest speaker give an award winning Unitarian sermon. The sermon was to be about Doing Your Part-titled Just How Much. The theme was to be just how much inequality and oppression do you take before you take a stand. This is a great topic and the psychological discussions alone would be enough to interest me. Plus this sermon has won awards and we Unitarians are a skeptical bunch so I was excited. I was entranced and inspired by Dr. Groth’s stories of her great, great, great grandfather’s fight for liberalism on the front lines of the Abolitionist movement. But by mid way thru the sermon I was very ill at ease, and by the fourth time the Reverend has used the term fascist to describe President Bush or a Right Wing Christian I was ready to leave in protest. THIS was liberalism? To me it was fundamentalism, not liberalism. Where there is no room for compromise, there is plenty of room for error; where there is only us and them, there is little room for me. I can get very passionate, but to me, this was not a Sermon, but a hate filled speech that stemmed from a viewpoint that once looked like mine. This goes back to my often held view that left wing fundamentalists, and right wing fundamentalists both have their backs against the same wall but are facing different directions. Many found the speech inspiring. In a way-so did I. I am inspired to never let the hate get into me that badly. I can’t shake the belief that this speech was given in a dozen other “fascist” Church’s just with “Right Wing” terms swapped with “Left Wing”. Hate is Hate. So Just How Far do I need to be pushed until I stand up for what I believe in? I think I answered that question a year ago when I sold my sports car and started this wild journey into a more sustainable lifestyle. I almost never attend rallies. Rallies in the 60’s changed the world. But today the world itself has changed and most rallies seem to me to be more slacktivism than something that will actually change anything. I have chosen a different path-it was intended to be one of action, but in the light of today’s sermon I think it is religious as well. Mia and I have chosen to lead by example where we can, and are building our lives from our clothes and food, to our yard and our cars to be something that others can look to and say-I could do that to! But lately we are taking more active roles. Take this week for example. Today I attended a training seminar with Sustain Dane to become trained in facilitating study groups for The Natural Step which is the Sustainability Model our Village has chosen to follow. This Spring I will be leading groups to help educate our community to start to change. Tuesday I will working with our Green Committee to begin the process on managing the stormwater in our community. And then Thursday I will be at the kick off meeting for the Smart Growth Steering Committee for our village as one of 3 chosen to guide our village through the planning process to hopefully avoid anymore sprawl here. I may not be standing on a corner with a sign, but I also think I am doing more good. Am I angered by the actions of our Federal Administration? Hell Yes. But I refuse to dirty my mind with hate for them. I said earlier that I am coming to view our decision to change others through our actions as a religious act. Jesus very rarely got angry (I certainly can’t see him saying this speech), instead he helped thousands learn to live better lives by living his life as a servant-meekly helping his fellow man. Perhaps it was my recent attending of a Green Sanctuary meeting, but I am thinking that environmentalism is a religious and moral act. And I choose to follow in the steps of the service oriented love of Gandhi, Buddha and Jesus, not the hate and fundamentalism of Dr. Groth. Well the engineering proposal’s are in and I have 4 days to read through about 300 pages of what can at times be some pretty technical stuff. For the record I am not an engineer. I have never studied law, and do not know how to implement a utility from the ground up in accordance with state law. So that meant the first 20 pages took me 2 hours as I taught myself about GIS (think Google Earth but with demographic data) mapping, ERU (Estimated Runoff unit?) measurement and allocation, IDDE plans (Illicit Discharge Detection and Elimination) and a dozen other things that I had no concept of until yesterday. However, in the next 4 days I will be forming an opinion on which engineering firms can best meet those challenges as we are choosing the top 3 this coming Tuesday. Then we will be interviewing those 3 firms to make the final recommendation to the board. Crazy. The end goal of this huge project will be that we will allow ourselves to backcast our development for the next 10 years, and install a Storm Water Utility to hopefully install a fee-bate system to encourage the promotion of stormwater best management practices (BMP). Backcasting? Think of it as the reverse of forecasting. Instead of saying “in 10 years we will have x acre feet of runoff” we instead plan for “in 10 years we want to have no more runoff than now-what do we need to implement now to achieve that”. The difference is subtle, but backcasting gives the planners the power to set goals instead of letting sprawl gain inertia that becomes uncontrollable. FeeBate? I love feebates. Basically you tax the behavior you wish to control (excess runoff) and use that money to fund initiatives that promote the behaviors you desire (BMP’s). Think of it as taxing the Hummers to pay for hybrid rebates. You legislatively modify behavior in a budget neutral fashion. Sweet! BMP’s? These are legion, and include various practices to promote infiltration and water holding to both limit runoff and control pollution. Bioswales are a great example . 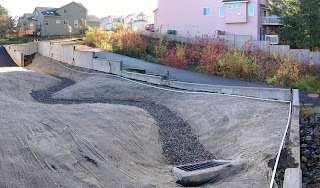 Instead of draining large impervious surfaces like a commercial parking lot into a stormsewer, you direct the water into a bioswale which increases percolation to recharge aquifers and contains plants that trap and neutralize non point source pollution. Basically they are rain gardens on a much larger scale. The crudest example of a BMP would be a detention basin that hold runoff to meter out the runoff-we are thinking much broader than that. The most encouraging aspect of all of this is that we have almost a dozen large, well funded engineering firms with great track records vying for this project-and we are only a village of 2000 with a small ($ qtr million) budget. Again, the technology and infrastructure are there-we need only the political will to do it. The Utility will be self funding, and the entire project was funded by a state grant-this entire process will be virtually cost neutral to our community, and in the long run will save literally millions in avoided infrastructure improvements as we no longer need to build massive conduits to handle excessive unplanned runoff. Being Green isn’t hard. Deciding to be Green is the most important step-be it for an individual, a business, or a city. For many years now Ecomama and I have been practising Unitarian Universalists. The liberal, inclusive, honestly moral congregations fit our worldview very well and provide us fertile ground to develop spiritually while allowing us to contribute and fellowship as a community. Recently our Congregation has reaffirmed our conviction that this is our spiritual home by choosing to start down the path to becoming a Green Sanctuary. In a nutshell the program is a statement of conviction that the congregation will include sustainability and care for the Earth and its creatures as a core value. Specific focus in placed on increasing awareness, personal accountability and the incorporation of an environmental ethic into the spirituality of the congregation. I have long believed that Environmentalism is a moral choice with its roots established deeply in the persons ability to empathize with others, make unselfish decisions, and live a life of compassion to others and future generations. Plans are flying at a furious pace right now including everything from installing green roofs to hosting monthly seminars on environmental issues in our building that would be open to the public and actively marketed. If this sounds right up my alley, your spot on! Sustainability is edging more and more into religious circles, be it Buddhist, Christian, or others as congregations awake to the fact that our current economic and societal behaviors are destroying creation and leaving the world in a sad state for our children which conflicts with the core ethics of most major religions. Religion is often at the forefront of societal change-and I am honored that our congregation is doing its part in Being the Change.